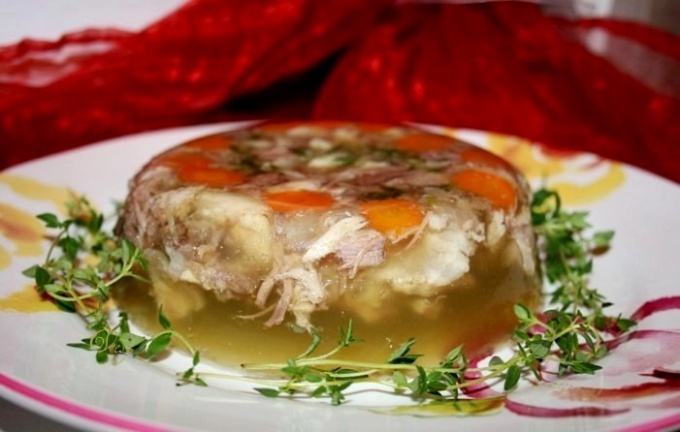 Chicken aspic is a delicious dish that is perfect for any occasion. Unlike recipes that use fatty meats, jellied poultry is cooked quickly and simply. Before you cook chicken jelly, you need to decide whether to add it to the gelatin or not. The fact that the substance that turns the broth in jelly, in large quantities is contained only in the cartilage of chicken feet and chicken carcasses sold in stores without them. So if you are going to cook the jelly without adding gelatin, the additional purchase on the market chicken legs, which quantity depends on the planned volume of aspic. Wash the chicken and have it. Put the bird into a saucepan and add water to cover the pieces. If you pour too much, the soup will not be rich, and the taste of the jelly will be impaired. After boiling, add salt to taste, a few peas of black pepper, a few Bay leaves. To make the broth transparent, appearing foam must be removed with a slotted spoon. Boil the poultry until fully cooked, the longer it will be, the more tender the meat will be and the richer the broth. Chicken jelly is good because it can be prepared for an hour, while jellied meat will have to cook much longer. Once the chicken is ready, remove it from the pan. When the meat has cooled, separate it from the bones and cut into small pieces, which will be more comfortable there. If the broth was cooked with the legs, after the end of cooking they should not add to the jelly. For making aspic with chicken legs immediately proceed to the next step. If the broth was cooked without them, take gelatin. Dissolve with its broth according to the instructions on the package. Instant gelatin does not require pre-soaking and straining, so cooking with it easier. The amount of gelatine depends on the volume of liquid, often pack a medium size is enough for 500 g of jelly. Put the prepared poultry meat in a wide container and pour broth. When it has cooled, put the dish in the refrigerator. After a few hours the jelly is ready for serving.